MOGADISHU, Somalia — The Islamic State group’s growing presence in Somalia could become a “significant threat” if it attracts fighters fleeing collapsing strongholds in Syria and Iraq, experts say, and already it seems to be influencing local al-Shabab extremists to adopt tactics like beheadings. The U.S. military this month carried out its first drone strikes against ISIS fighters in Somalia, raising questions about the strength of the group that emerged just two years ago. A second strike targeted the fighters on Sunday, with the U.S. saying “some terrorists” were killed. The Islamic State group burst into public view in Somalia late last year as dozens of armed men seized the port town of Qandala in the northern Puntland region, calling it the seat of the “Islamic Caliphate in Somalia.” They beheaded a number of civilians, causing more than 20,000 residents to flee, and held the town for weeks until they were forced out by Somali troops, backed by U.S. military advisers. U.S. forces say they have carried out three drone strikes within 24 hours in Somalia, stepping up their campaign against the Islamic extremist rebels of al-Shabab and the Islamic State group. For more than a decade, al-Shabab has sought a Somalia ruled by Islamic Shariah law. Two years ago, some of its fighters began to split away to join the Islamic State group. 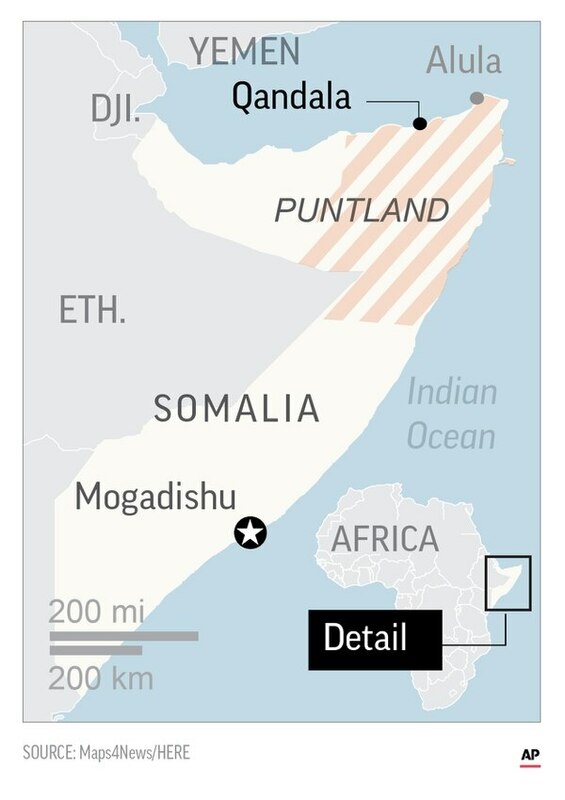 Some small pro-ISIS cells have been reported in al-Shabab’s southern Somalia stronghold, but the most prominent one and the target of U.S. airstrikes is in the north in Puntland, a hotbed of arms smuggling and a short sail from Yemen. The U.N. experts documented at least one shipment of small arms, including machine guns, delivered to the Islamic State fighters from Yemen. “The majority of arms supplied to the ISIL faction originate in Yemen,” ISIS defectors told them. A phone number previously used by the ISIS group’s U.S.-sanctioned leader, Abdulqadir Mumin, showed “repeated contact” with a phone number selector used by a Yemen-based man who reportedly serves as an intermediary with senior ISIS group leaders in Iraq and Syria, the experts’ report says. While the Islamic State group in Somalia has a small number of foreign fighters, the Puntland government’s weak control over the rural Bari region where the ISIS group is based “renders it a potential haven” for foreign ISIS fighters, the report says. The ISIS group’s growing presence brought an angry response from al-Shabab, which has several thousand fighters and holds vast rural areas in southern and central Somalia, in some cases within a few dozen miles of Mogadishu. Al-Shabab arrested dozens of members accused of sympathizing with the Islamic State faction and reportedly executed several, according to an upcoming article for the Combating Terrorism Center at West Point by the center’s Jason Warner and Caleb Weiss with the Long War Journal. 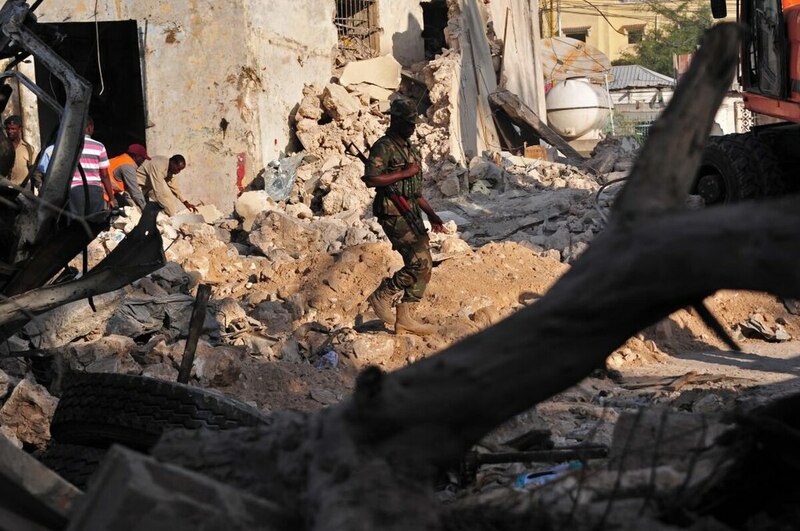 Civilians in areas under al-Shabab control have suffered. “Possibly in response to the growing prominence of ISIL, al-Shabab imposed more violent punishments, including amputations, beheading and stoning, on those found guilty of spying, desertion or breaches of sharia law,” the new U.N. report says. Some Somali officials say al-Shabab has begun to de-escalate its hostility against the ISIS fighters as its initial concerns about rapid growth have eased. Al-Shabab has begun to see ISIS in Somalia as a supplementary power that could help its fight against Puntland authorities, said Mohamed Ahmed, a senior counterterrorism official there. “For them, getting arms is a lot easier than funds because of the tight anti-terrorism finance regulations,” said Yusuf Mohamud, a Somali security expert. For now, no one but al-Shabab has the ability to carry out the kind of massive bombing that rocked Mogadishu last month. For the Puntland-based ISIS fighters to even reach the capital, they would have to pass numerous checkpoints manned by Somali security forces or al-Shabab itself. That said, two Islamic State fighters who defected from al-Shabab and were later captured told the U.N. experts they had received airline tickets from Mogadishu to Puntland’s Galkayo as part of the ISIS group’s “increasingly sophisticated recruitment methods,” the U.N. report says. Scenarios that could lead to ISIS fighters gaining power include the weakening of al-Shabab by the new wave of U.S. drone strikes, a new offensive by the 22,000-strong African Union force in Somalia or al-Shabab infighting, says the upcoming article by Warner and Weiss. That’s exactly what the U.S. military’s first airstrikes against the Islamic State fighters this month were aiming to do, Somali officials told the AP. The U.S. says it is still assessing the results.